Following the news of the investigation by the Competition and Markets Authority (CMA) into a suspected breach of competition law by three rolled lead suppliers, Midland Lead’s Managing Director Boudewijn Tuinenburg comments. Midland Lead was invited to feature in the latest Parliamentary Review alongside fifteen other companies in manufacturing and service, representing the metals, materials and fabrication sector. In 2018 Midland Lead has been invited to feature in the latest Parliamentary Review alongside just fifteen other companies in manufacturing and services representing the metals, materials and fabrication sector. Download our entry here. We are delighted to announce that we have been awarded a very high accolade as h&b Group’s Supplier of the Year 2018. 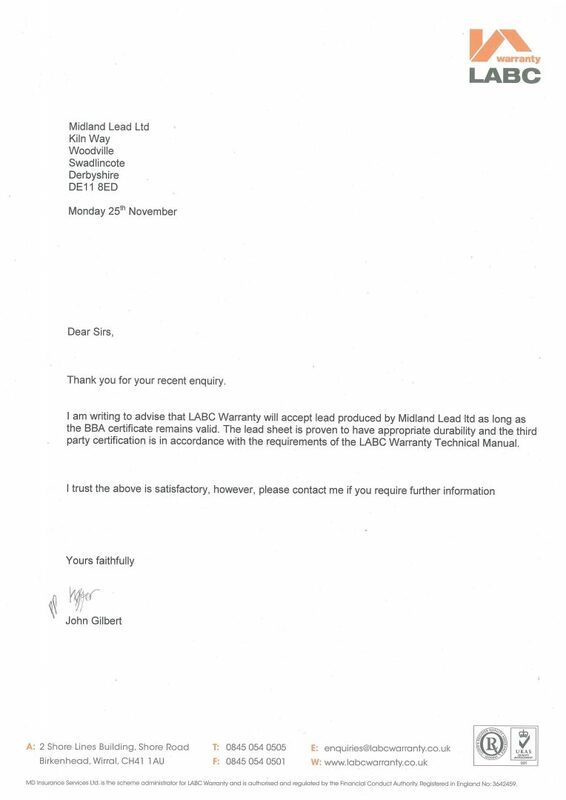 The leading construction warranty provider NHBC have reconfirmed their approval of our premium machine cast lead sheet. Put a face to a name... Our Midland Lead sales team is on hand to help you with orders, queries and enquiries. Get in touch today! Leading British lead manufacturer Midland Lead has made significant appointments to its sales team and added the National Buying Group (NBG) as a new customer. From copper nails and flexible lead joints to fixing clips and patination oil - here's an overview of the construction ancillary products we have on offer. Russell Roofing Ltd recently restored the lead roof of historic Grosvenor Crescent, in West London's sought-after Belgravia district. More about the project in this case study. Our most recent addition to our ancillary product range is the professional roofers set, offering two fantastic products in one deal: a slate cutter with hole punch and a tinsnip. These two tools work hand in hand to make sure roofers have everything they need to resize and shape slate and metal sheets. Go hands-free with our hammer belt loop! Use this ultimate convenience product and transport your hammer while keeping your hands free. Midland Lead supplied 1740 square metres of lead-lined board, ranging from 1.00mm through to 3.5mm in thickness. In addition, we also supplied 95 square metres of lead-lined plywood with accompanying lead strips. Our products were used within diagnostic x-ray, mammography, ultra sound, CT interventional and critical care facilities within the hospital. Midland Lead supplied the radiation shielding for the newly launched Imaging Centre for Excellence in Glasgow. A mix of Code 4 lead-lined plasterboard and lead-lined plywood pattress panels were supplied, alongside lead fillet strips suitable for preventing radiation leakage at flat board joints and corners. Now available as part of our growing ancillaries range, the plugging chisel is forged from high quality carbon steel, to ensure it doesn’t splinter when pressure is applied. This tool is ideal when undertaking refurbishment of a roof where there are damaged slates. The slate cutter is an innovative tool, designed to makes the lives of professional roofers easier when fitting slate roofing. Midland Lead has launched a stock profile to help new builders’ merchants get an understanding of the quantities and types of products they should order. Click here to find out what Midland Lead can do to help establish your stock levels and turn your depot into a building professional’s haven. The right finishing touches can make a world of difference when it comes to working with lead and getting that professional finish. Flashing clips are an integral part of achieving that high-end finish - read more here. Lead brick product datasheet for use in radiation shielding applications in a variety of sectors. Lead-lined plasterboard product datasheet for use in radiation shielding applications in a variety of sectors. Lead-lined timber battens product datasheet for use in radiation shielding applications in a variety of sectors. Lead-lined plywood product datasheet for use in radiation shielding applications in a variety of sectors. To help keep these products in the forefront of roofing professional’s minds, Midland Lead offers eye-catching display units to showcase the patination oil and cleaning gel at the point of sale. The counter display unit holds six 125ml bottles of cleaning gel and six 125ml bottles of patination oil. The two products are essential in every roofing professional’s toolkit, working hand in hand to protect and restore leadwork. Midland Lead is looking to increase its export sales to the Middle East through attendance at one of the biggest events in the healthcare industry, the Arab Health Exhibition in Dubai. More info in the press release attached. In preparation for exhibiting at Arab Health 2017, we've prepared a brief overview of healthcare projects we have supplied in the Middle East. Download our 2 page brochure to read more. This heritage project - including 40 tonnes of sandcast lead code 7 - saw the Cathedral's original lead recycled and use to re-roof the building by Norfolk Sheet Lead. Contractor Leadwork UK uses 15 tonnes of lead sheet for the restoration of The Georgian House of London's famous Hampton Court Palace. Throughout 2017 Midland Lead will focus on a different ancillary product every month, to make sure your roofing projects gets a professional finish. This January we focus on Hallhooks. Midland Lead Healthcare supplied lead-lined plasterboards with accompanying lead strips and battens to Northwest Surgeons for use in the construction of a new CT scanning facility. In addition, we supplied both an internal and external lead door together with a lead viewing window. All products were code 5, suitable for use across a range of diagnostic applications. Renowned property expert, writer and TV presenter Sarah Beeny approached lead sheet manufacturer Midland Lead, when she began improvement work on a South London property. Working on an extension to the turn of the century, late Victorian build, Sarah decided she wanted traditional lead detailing around the valleys and windows. Britain's largest industry survey of its kind has exposed a lack of accreditation knowledge among those working with lead in the construction industry. Eight amazing facts about the recycling of lead for the healthcare . Introduction to Midland Lead - construction, healthcare, heritage and more! Information and guidance leaflet for visitors and contractors on-site at Midland Lead's manufacturing facility. Midland Lead's introduction PDF to our new and contemporary metal cladding solutions. One of Midland Lead's new additions to our construction ancillary products - the Hallhook. See here how and when to use. Midland Lead, leading British manufacturer of machine cast lead, has invested £122,000 into supply chain upgrades, in a move that marks part of a wider drive to support emissions reductions in the UK. In this brochure you'll find a brief overview of our healthcare product offer together with our service we offer contractors dealing with healthcare or radiation protection projects. Both the differences and similarities of rolled lead versus machine cast lead outlined. Midland Lead supplied 2400 sqm of lead-lined boards with accompanying lead strips and battens to Astins, the drylining contractor for the construction project. The boards were supplied in both plywood and plasterboard with lead shielding ranging from Code 3 through to Code 7. On our manufacturing site in Swadlincote, vehicles will only be loaded and unloaded within our business opening hours: 8.30 - 16.30 from Monday to Friday. Midland Lead, leading British manufacturer of machine cast lead, is launching a new range of metal cladding solutions at this year's RCI show; the UK's Roofing, Cladding and Insulation event. Midland Lead supplied 550 lead-lined plasterboards and the related lead-sealing strips for use in the new Birmingham Dental Hospital and School of Dentistry. Read more about this case study. In March 2014, Midland Lead supplied lead-lined gypsum boards and the associated lead fillet strips for use as radiation protection within an x-ray facility at a newly constructed dental clinic in Tanzania, East Africa. A brief guide on working with machine cast lead sheet - storage tips, best-selling ancillaries and much more. Our machine cast lead is BBA accredited. Details of our latest certificate. One of the most common usages of lead sheet is in the building industry. Over the years, hundred thousands of tonnes of our lead sheet has been successfully used to weatherproof a variety of prestigious UK buildings. Some are listed here. Preserving the past - Download our heritage project portfolio to see a list of heritage projects (English Heritage, listed property homeowners, church authorities) where our sandcast lead has been successfully installed. Midland Lead operates under an environmental management system. View our ISO 14001 certificate here. This guide gives advice on the installation of plain lead sheet, laminated lead plywood and lead plasterboard within small healthcare practices. It details the application of the material to a plain wall and gives information on corners between walls and junctions with floors, ceilings, door frames and electrical fittings. Read all about our machine cast lead and its suitability as a radiation protection material in healthcare. Know your facts from fiction when it comes to lead! Read all about the differences and similarities between machine cast lead and rolled lead sheet. Midland Lead operates under an Environmental Policy. Read the details here. Midland Lead is committed to providing a safe and health work environment. Read the details of our Health & Safety policy here. 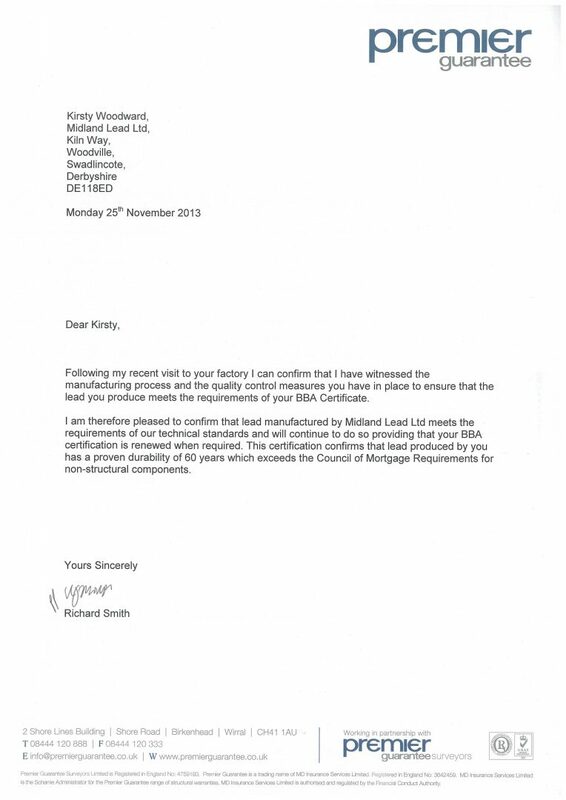 Midland Lead operates under an Occupational Health & Safety Management system. Details of our OHSAS 18001 certificate here. Read all about the research summary of a study undertaken by an Independent RPA regarding the use of machine cast lead and rolled lead for radiation protection. Read all about the research findings from TNO regarding the environmental performance of lead sheet and alternative weatherproofing products. Use this document to try and work out the weight of your lead sheet order with this handy weight chart. A brief overview of healthcare projects, where Midland Lead have supplied the radiation protection solutions. In our sandcast brochure, you can read all about the traditional process of making lead, our quality checks, tips from our heritage experts on how to make the most of your sandcast lead and our heritage ancillary product package.